No matter how much we Bangali's like to follow and lead the western lifestyle, there comes one day, when we all put on our favorite Punjabis, put on our most Bengali hairdo (i.e bhodro pola cut, not spikey) and rejoice all the reasons we have for being born as a Bengali. That day is Pohela Boishakh. No matter how much we post our love for the English New Years day, it is in this day that we come back to our roots and greet everybody in Bengali saying “Shuvo Naba Borsho”, not Happy New year. No matter how much we hate the crowd, and avoid common people, it is in this day that we get wild with the crowd, not minding who the person next to us is. Such is the magic of “Naba Borsho”to us. 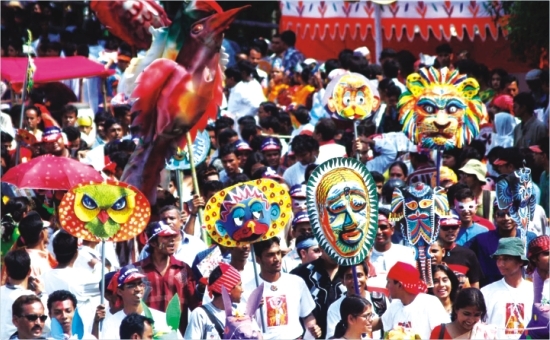 Every year on the 14th of April, the streets of Dhaka come alive with music and celebration. The first rays of the morning sun sings to the tune of Rabindronath Tagore's timeless song of the Boishakh “Esho He boishakh Esho Esho”. Businesses open their halkhata for starting a new business year; the people get ready to taste the juicy fruit of the Grishmo which is also inaugurated along with the dawning of the New Year. Here and there are Mela, pitching high volume songs of “Melai Jaire”. Panta Bhaat becomes the official recipe of the day, and going to Ramna Botomul is a must. In short, the whole nation of dormant Bengali is awakened this very day. For those who are skeptics, we have put together a little guide of what to do's in here. Maybe this will help you to shave off that boring clichéd line of “Dhaka is Boring” and find out new life where it isn't. The best way to start the new Bengali year is by welcoming the first sun rise of the New Year. With the rising of the new sun, Ramna Botomul begins to gather crowd a little at a time. Men put on their Punjabi while women of all ages put on their white and red sarees to welcome the coming of the New Year. Young hearts also flock around the Charukola in Dhaka University. A lively and colourful procession is brought out on the first light of the day. People dance their heart away in a frenzy of exuberance. For those of you who live in Dhanmondi, you can gather in the amphitheatre beside Dhanmondi Lake, where many eminent artists gather to greet the new Bengali year in style. If you are lazy and somehow missed the sun rise, it is still not too late to head for Ramna Park. As the music and celebration in Ramna Park goes on, Chhayanot performs music and poetry reading throughout the morning and the noon. A Mini Mela takes place in the park. You can buy such things as Haat Pankha, Dhol, Basher Baashi or paper and wooden decorative masks for your home or loved ones. You can also take a ride of a lifetime on a Charka or go get yourself a facelift, by coloring various designs or the word “Shuvo Nobo Barsha” on you face by an artist offering their skill for ten taka. Of course the main attraction of the park is Panta Bhaat, with fried Padmar Ilish to go. Gives a meaning to the cliché “Machhe Bhaate Bangali” But beware, make sure you bargain the price on the price of each plate of rice beforehand; sellers tend to rip off their customers. Just outside the Ramna Park, in front of Shishu Park, Rishijo Shilpo Goshti, headed by none other than Fakir Alamgir (not even closely related to Adnan Fakir), will mesmerize you with his brand of fiery Bengali revolutionary songs. He draws a huge crowd every year. So beware, if you are the type of person who doesn't like crowd, you are in for a bumpy journey. Actually the whole area in and around Ramne park is so crowded that it is easy to lose your friend or just lose yourself in it. Take care of your cell phones and money bag. If you want to avoid the crowd, walk to Charukola Institute. There aren't any concerts inside, but groups of students get together with their guitars and Dhol and sing Bengali songs. The Charukola takes a brand new look on this day. You will never see so much colour in your life. Still not interested! Man you are such a spoilt sport. If nothing else interests you, maybe this information will, Pohela Boishakh attracts the biggest number of girls in one place, (hmmm now you seem interested). In fact, half the reason for me to go and deal with the large crowd and human jam is to catch a glimpse of the Bengali women dressed up and willing to give you a glimpse of rare beauty. You will find a lot of couples inside the Dhaka University (my pick, The English Department), and lot more in amna Park. But beware of ogling too much, their boyfriends are lurking just around the corner. So I hope this short crash course got you excited on giving it a go from this year. Trust me, you wont regret it. And if you happen to catch me there, just say hi and hand me a cotton candy for being your good guide.